Carol started practicing yoga with Iyengar style. Since then, she has been practicing Hatha, Flow, Power, and Ashtanga Yoga. Uses Iyengar method as her main teaching focus, Carol emphasizes alignment and devises her class according to each individual’s needs and physical condition. 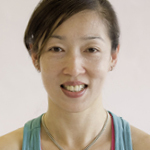 She balances the student’s needs by providing the suitable amount of “yin” or “yang” practice. In the “yang”, the active practice, she starts with core training and strengthening the weaker parts of the body to improve the student’s physical condition. As for students who are more stiff and tight or more uncoordinated, she uses a yin practice, a passive method to stay in the pose longer, along with deep breathing to relieve any physical discomfort.